this has been brought to Mikey's attention by me. First off The user who posted this isn't even in the USA, she is from Germany, she knows nothing of whats going on here but maybe by hearsay. For her to be making comments and threats that have no proof or substantiation she is in fact doing slander towards Mikey Busto's and AntsCanada. She never bought ants in the USA let alone have dealt with the GAN farmers here in the United States, so anything she has said is based on an oppion she came to herself. #1 Yes Solenopsis is an invasive species we all know that and the GAN farmers are to only sell them to people in the same state. SO RFIA are already active in Georgia, Alabama, Texas, so that means that any GAN farmer can sell thats species in anyone in the same state but not outside of that state (can not cross the border of that state). I know one of the GAN farmers in Georgia and he is very strict to have the person buying the ants show ID as proof they live in the state of Georgia. And that goes for any other species for any state. First off, the country I'm living in has absolutely nothing to do with this issue. Second, I did not say that you are doing illegal sales, I said your sellers (and customers) are potentially breaking the law when they sell RIFA across the RIFA quarantine zone borders (this may very well happen when you sell them to people from the same state), of which's existence many of them probably don't even know in the first place. Ok like anything with rules there are those that break them....... guy from Georgia buys ants from GAN Farmer in Georgia and then takes them outside of the state, that is not the fault of the GAN Farmer, the GAN project, AntsCanada, or Mikey Busto's! If the species is already active in a state and then taken to another that is isn't active in that makes it an invasive ant simply put. I did not say that you are responsible if someone buys them and then brings them out of the state. That would be nonsense as it is completely out of your control. However the RIFA quaratine zone runs straight through the middle of a lot of states (Georgia is not affected as it is already entirely overrun by RIFA and completely within the quarantine zone), also keeping RIFA is illegal in several states (for example California). And in the end Solenopsis invicta is not a native ant, so technically it's against GAN rules anyway. Last edited by Serafine on Wed Jul 19, 2017 9:20 pm, edited 6 times in total. Again the user "Serafine" has no proof of wrong doings, has no proof of sales outside the State of which the GAN farmer is based, everything she has stated has no backing to it what so ever. Please read my post again. 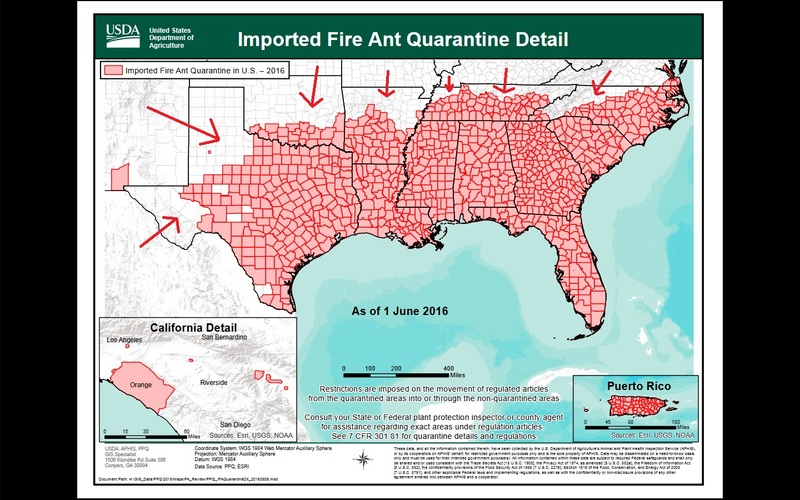 The issue is NOT that people are selling ants to other states, the issue is that selling Solenopsis invicta to a person in the same state is potentially illegal when the ant colony crosses the RIFA quarantine zone border. Solenopsis invicta should be excluded from sales at least in these states to avoid potential unintended or accidental illegal sales (most people probably do not even know that there's a quarantine zone for RIFA) and the further spread of this highly problematic ant species. At best prohibit the sale of this species entirely. It is considered a major pest, there is no reason to risk spreading it further and in the areas it has already overrun it is so dominant that finding a queen should not be an issue for anyone. BTW: IF she says she lives in the USA she has also lied on the location in her Account Location. All the information I posted is directly from your GAN store page where it is freely available for everyone. Just search for Solenopsis invicta (there's lots of entries) or unidentified black ants sold in glass bottles. And to the final subject, If anyone has an issue with AntsCanada or Mikey Busto's please send an email to one or the other but do not make a posting like this posting false info or unaccredited info in an attempt to cause slander towards AntsCanada or Mikey Busto's will be permanatly banned from the AntsCanada Ant Forums. This is in the rules that you agreed upon when signing up for the forums. Neither do I have an issue with Mikey, nor with AntsCanada, nor did I post false information. All the information is from the public GAN store page. Look at it, it's all there. I do in fact think that GAN is a really really good idea if it is run properly. I have talked to several people that have joined GAN a while ago or just recently and all of them are saying that GAN is an unmoderated and unorganized mess. For example some people got several males stating that GAN takes a $10 fee from their sales and further mails saying it doesn't, leaving them completely confused. GAN needs a major cleanup, better moderation and you should consider if the intend of wanting people to appreciate their local native ants and selling highly invasive creeping ecological disasters like red imported fire ants is compatible at the very core. Furthermore the GAN rules need to be enforced at least on the very store front page. The GAN rules clearly state that you cannot sell ants without workers through GAN so there should not be any queens with just eggs or even lone queens completely without brood available for sale on the store page (yes there are, both of these). Also people should not be able to sell completely unidentified ants in improper housings like glass bottles (keeping them in glass bottles is a violation of GAN rule #1, selling undidentified ants should be a one as well) - that makes the entire project look terrible. If GAN gets these issues fixed I will valiantly advertise it, maybe even join it (Europe could use some local species appreciation as well, it's probably even worse than in the US here as you can just buy any exotic species you want if you hand over enough bucks at one of the many ant stores). I am not doing this because I want GAN taken down, I'm doing this because I want GAN to be fixed. So please make GAN great again, we will all benefit from a strong project that makes people appreciate their native species. This is a picture of the RIFA quarantine zone (I added the arrows for more clarity). As you can see it covers only about three quarters of Texas and North Carolina, half of Arkansas and just a quarter of Oklahoma and a fraction of California - so selling Solenopsis invicta colonies only to people from the same state does NOT mean you're automatically fine. Maybe that helps to better understand the issue. Note that I'm not saying you should drop any of your sellers from GAN, all I'm saying is that someone should take a look at the store page entries and remove those entries that obviously do not meet GAN standards, like colonies without workers (including lone queens), colonies in improper housings, non-native ants that could potentially cause accidental legal issues (mostly RIFA in certain states) and completely unidentified ants. Also selling invasive species like RIFA, Argentines, Pheidole megacephala, Yellow crazy ants and other ants in areas where they're not native shouldn't be allowed. I don't think that's an unreasonable call. HEEEEEEEEEATED DEBATE SECTION YEEEEEEEEEEEEEEEEEEAH. But I have a serious question for Serafine: Why do you care about the spread of RIFA in the USA if you're on the opposite side of the world? Also, how is RIFA going to spread by this. If anything, the queen of the species is being REMOVED from the environment, preventing her from starting her own colony in the wild. Yeah, there's a risk of them escaping, or the owner releasing them, but it's better than the queen having a chance to start her own colony in the wild. But again, how does this affect you?? You must care a lot about ants and I respect that, but if you report the GAN Project you could be removing a source of income from people all across the world. Also, how is RIFA going to spread by this. If anything, the queen of the species is being REMOVED from the environment, preventing her from starting her own colony in the wild. Yeah, there's a risk of them escaping, or the owner releasing them, but it's better than the queen having a chance to start her own colony in the wild. But again, how does this affect you?? You must care a lot about ants and I respect that, but if you report the GAN Project you could be removing a source of income from people all across the world. In the areas RIFA has already overrun the species is so dominant that is has effectively wiped out most native species. Ask people from southern Texas or Alabama, they are barely able to find any queens other than RIFA. Taking a RIFA queen (or even a few hundred queens) out of it's environment achieves nothing - there are so many of them that only a tiny fraction of them can found a colony in a spot that is not utterly dominated by an existing RIFA colony already anyway. However a single escaping colony is enough to establish a new population (especially now that there is an increasing number polygynous RIFA strains that can mate in the nest and spread by budding) which will expand and wipe out most native species in the area to a point where RIFA is pretty much the only species left. The species extremely problematic, highly invasive and can cause horrendous environmental damage. Such an ant species should not be available for sale in a project geared towards the appreciation of native species. Another species that is not mentioned either is Raspberry Crazy Ants (Nylanderia fulva, a species of small formicine acid-spraying ants) which are currently wreaking havoc in Florida, even outcompeting Solenopsis invicta. This species should not be available through GAN either (it currently isn't but there's nothing to prevent someone from selling it if people can sell RIFA) as well as other invasive ants like Argentines (who's supercolonies dominate large areas in California and southern Europe), Pheidole megacephala (bigheaded ants), Lasius neglectus (a supercolony-forming Lasius which is an increasingly problematic pest in central europe) and others like these. But I have a serious question for Serafine: Why do you care about the spread of RIFA in the USA if you're on the opposite side of the world? I care because I think that at it's core GAN is a really really great idea. It just needs a major cleanup and an actual enforcement of it's own rules. GAN is a worldwide project and Europe is in dare need for some local species appreciation - since you can just buy any exotic species if you hand over enough bucks at one of the many ant shops a lot of people here consider local/european species boring and uninteresting. It's probably even worse than in the US. If anything Europe needs a proper GAN more than America does. Also there are some stores in Europe that resort to pretty shady practices like mass-founding Camponotus ligniperda with dozens of queens in a single container then picking out some workers and a queen and selling them (which often results in infertile queens or dysfunctional colonies being sold), overextended hibernation of queens (to delay colony founding so they don't have to feed them) and smuggling ants from tropical countries. A native ant project with a proper framework (like a platform where the development of colonies that are up for sale can be monitored (with at least one update per month) until they are sold) could be a real thing here. If people see that sellers put effort and quality into the ants they sell they will prefer them over the larger ant retailers (or force the stores to raise to the same standards which would be an even better thing). GAN in Europe could be a success but it requires much more effort and infrastructure than it currently has. Yeah actually now I agree with you. Except for some reason it's actually legal in California to own Argentine ants without a permit.